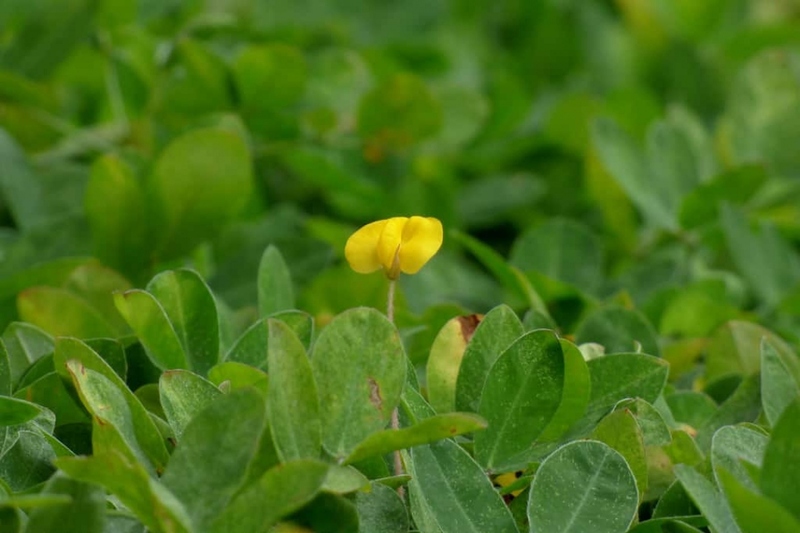 Peanuts (Arachis): growing, planting, caring. You have to grow peanuts once in your life to understand where the expression ‘work for peanuts’ comes from. You have to plant a lot of peanuts to collect the equivalent of a packet of peanuts, but it can be fun! At the first glance, peanuts are like clover, as the leaves resemble each other, but they are not organized in the same way. Most surprisingly, peanuts, which are harvested underground, are the fruits of groundnuts, not rhizomes or tubers. It forms them off the ground before burying them. It’s weird, but it’s like that. The support of the fruit is able to fold and drive it several centimeters underground. Attention, only the warmer regions are suitable to grow peanuts, because they require heat and fear frosts - It is originally a South American plant! The groundnut bears opposite leaflets grouped by two or three pairs. It is an annual plant which sometimes reaches 70 cm, with an upright or creeping habit. It bears yellow, papilionaceous yellow flowers. After fertilization, fruits are formed in the form of peanuts - it should not surprise anyone - protected by swollen pods. Groundnuts are from the Fabaceae family. Groundnuts have opposite leaflets grouped by two or three pairs. It is an annual plant that sometimes reaches 70 cm, with an erect or creeping habit. It bears yellow, papilionaceous, yellow flowers. After fertilization appear fruit shaped peanuts - unbelievable - protected by bulging pods. Sow seeds that have not been roasted ;-) Outside: In the southern region, sow in rich and well-drained soil, limestone, in full sun and sheltered from the wind. Bury the seeds 8 cm, every 40 cm, after unpacking the soil if needed. Water moderately. Inside: Sowing under shelter is possible: bury the seeds of only three centimeters in a mixture of potting soil and sand. Choose a large and deep container. When your peanuts have reached twenty centimeters, pull the earth around to form mounds. Water regularly at first, but not excessively because peanuts prefer dry soils. In pots, the worst enemy of your peanuts is mold, avoid soaking the earth. Depending on the variety, the seeds are ripe in 3 to 5 months. When the foliage is completely yellow, it's time to pluck your peanuts and recover the seeds in the soil. Take them out with a pitchfork. Let them dry in the sun for several days. Repot your seedlings after a month in pots 30 cm wide, so that your peanuts have room to bury their seeds. Lay a layer of gravel at the bottom of the pot, covered with potting soil or very fibrous compost. Peanuts fear excessive moisture, which causes parasitic fungus growth on the leaves. Indoor, many types of insects can sting the leaves, but will you spray an insecticide in your home to harvest some peanuts? You have harvested everything? Then you can flatten the mounds for another crop.